Red Leaves and the Living Token is Benjamin David Burrell’s first book. Previously a screenwriter, Burrell decided to self-publish the story of the Reds due to “the limited nature of screenplays, both in terms of length and feasibility of production.”1 The book has few reviews yet on Amazon and Goodreads (and both places seemed to contain the same reviews) but all give the book high marks, and one of those said the book was “superbly” written. I disagree. In fact, this may be the most poorly written book I have ever read. At the very least, it is in desperate need of a professional editing job; by the first chapter, I wondered if it had even been edited at all. The only real ‘moral of the story’ seems to be that just because you don’t believe (in) something doesn’t mean you should keep the people around you from learning about/believing in it. This is a valid enough point, but it tends to get lost in the poor quality of writing. There is, of course, a political struggle, but it feels vague, contrived, and unremarkable. Each of the three nations—Petra, Botann, and Zo—wants to claim ownership of the Red and the religious relic, the Token. What they would gain from this besides a hollow sense of superiority seems terribly unclear. 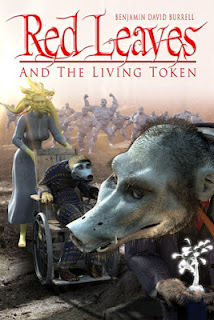 Red Leaves and the Living Token is a perfect example of the dangers print-on-demand, self-published books pose to the publishing industry—especially authors—as a whole. Here sits physical proof that ‘anyone can (and will) do it,’ making it even harder still for decent authors to gain due respect and be taken seriously in this 9-5 world. It’s common to end a book review with a recommendation for readers, but I can only—in good conscience—recommend this book to anyone looking for an example of how NOT to write a book. My sincere apologies to the author, as I’m certain this review is not what you had hoped for. Perhaps, with an editor who can tell the difference between ‘hopped’ and ‘hoped,’ it could be good. My advice is to hire one. I assure you, it’s worth the money. Jessica is correct. The copy she reviewed had not yet been edited. It has since been through the magic hand a competent editor.